life of a lost muse: Mani Monday! Tonight I get to make some Christmas wishes come true. I'm in Junior Auxiliary and tonight is our annual Christmas shopping outing for the Angel Tree. Every single child on our Christmas this year will get some fabulous presents straight from their Dear Santa wishlist. I wanted to do my nails in something cute to match our Christmas shirts, but then I thought...well, we'll be grabbing and buying and bagging and wrapping -- this mani is going to get tore up. So I went with a simpler alternative. I just did a few coats of "Vivien" from Julep's American Beauty collection. 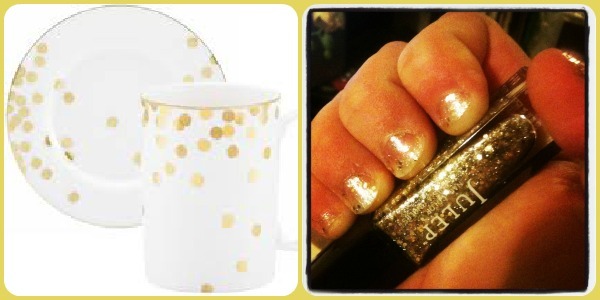 It's a gorgeous clear coat polish that features gold micro glitter as well as huge gold glitter flakes. I feel like my nails are very 'Kate Spade' right now! Do you like? I know it's super simple, but at the same time I'm feeling pretty festive!